Cult of Ani: To know her is just about the only way to love her. 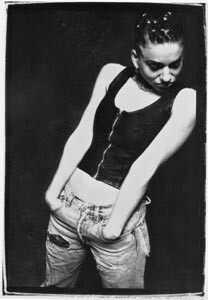 BECAUSE SHE DOES NOT FIT the standard mold for a female singer, Ani DiFranco has often been called "angry" by certain misguided members of the media when they really mean "strong." After all, what's DiFranco got to be angry about? In the last eight years, she has become a major player without benefit of a major label, putting out albums on her own Righteous Babe imprint, touring steadily, and nailing down the cover of Spin --not to mention that of Ms. This year, DiFranco was even nominated for a Grammy--and all practically without benefit of lipstick. That's a pretty impressive achievement for a 26-year-old, and one that no fan of Fugazi could find fault with. But although DiFranco's liberal ideology and indie economic policies are admirable, her artistry is suspect: her success is based entirely on the force of her personality. DiFranco's persona is so integral to her music that it would be hard to make sense of much of it without having taken a crash course in "Ani" first. DiFranco actually won her initial following with the lesbian crowd (although she no longer claims the title, having recently fallen in love with a man). With her bright-green buzzcut and combat boots, she has also managed to position herself as an alternative artist, but the truth is that, musically anyway, she's only a short step to the left of more conservative lesbian folksingers who play to the converted on labels like Olivia and Redwood. Indeed, despite a slightly more modern hip-hop aspect to the rhythms she uses behind her songs, DiFranco is folky and sentimental. She relies on many standard folksinger tricks, including a fake country accent (she's really from Buffalo, N.Y.) and heavily strummed guitar. As is true of most folk artists, DiFranco's focus is on lyrics. She also prefers a kind of spoken-word delivery (patterned after black poets like bell hooks) that is reminiscent of children's storytellers who put so much expression into their readings that you can't even listen to them: "And then the evil wiiiiitch put a glass sliver into the princess' heart." DiFranco is not an insignificant singer or songwriter, but those qualities tend to get lost on her records, beaten into oblivion by her overpowering delivery. She earned her large audiences with diligent touring and a live show that incorporates humor, sensitivity, and charisma. Although she's often compared to Bruce Springsteen, her voice, like Björk's, is very much an acquired taste, and if you don't acquire it, it's going to annoy the hell out of you. Little Plastic Castle, scheduled for mid-February release, is DiFranco's 11th album, though only the last two (Dilate and Not a Pretty Girl ) are well known. The last two years have seen her go from cult star to cover girl, but, alas, the area in which she shows the most growth is in pretentiousness. While her turn of phrase can be impressive, full of lilting and unusual images such as "I promise I won't squander your gaze" and "The stupid circumstances we slalom through," she undermines her songs with an almost obsessive self-referentiality. On the title cut, for example, DiFranco makes an analogy between her own life and that of goldfish in a bowl, then (having courted the attention) complains bitterly about being looked at. "People talk about my image as if I come in two dimensions/ like lipstick is a sign of a declining mind/ like what I happen to be wearing the day that someone takes a picture/ is a statement for all of women kind." On "Pixies," she criticizes critics who describe her as "a pixie, a paper doll, a cartoon" and begs them to "be nice." For someone who doesn't want to be judged by others ("Before you throw those stones at me, tell me what is your house is made of"), however, DiFranco is surprisingly critical. "All the privileged white kids on TV," she sings, "brandishing their cold cuts with their ghostly makeup and their heroin breath." Elsewhere she complains, "Now everything is cross-marketing/ it's about sunglasses or shoes or guns and drugs." Unfortunately, DiFranco's words only make you ask yourself, 'Is this really the kind of subject matter that makes an interesting song?' And the answer is no. But like many musicians who put out their own records--and many a motormouth--DiFranco is wildly impressed with her own talents, and she doesn't seem to have any critics or collaborators to guide her around these pitfalls. This flaw is most obvious in her more bombastic lyrics. "They were diggin' a new foundation in Manhattan and they found a slave cemetery there!" she exclaims on "Fuel," adding, "May their souls rest easier, now that lynching is frowned upon and we've moved on to the electric chair!" Could she be any less subtle? There and elsewhere, DiFranco seems to be overcome by her own facility with language, and the problem with that kind of overemotional writing is that the analogies often aren't even true. After all, comparing the lynching of innocent black people to the lawful killing of criminals who've been convicted by trial is both specious and disrespectful, whether you're pro-capital punishment or against it. But time and again, DiFranco beats her subjects over the head like that, and the tactic isn't doing anybody--the subject, the listener, or DiFranco herself--any favors. DiFranco is obviously smart, articulate, and well-meaning, but her album is all too aptly named. She does seem to live in a little plastic castle, and until she stops throwing stones from the roof of it, she's going to remain a royal bore. From the January 29-February 4, 1998 issue of the Sonoma County Independent.